Lessonly is purpose-built to help teams learn, practice, and Do Better Work. If you can write an email, you can build a lesson in Lessonly. Drag-and-drop to add text, images, videos, documents, quiz questions, SCORM, and more. We put learners first. 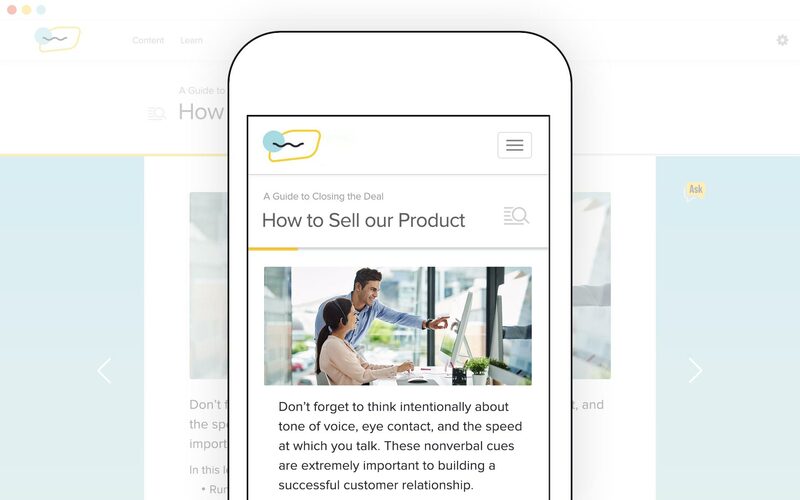 Our simple, mobile-friendly experience lets teams train—anytime, anywhere. 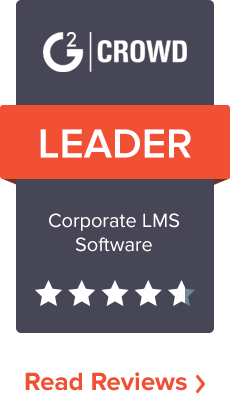 Assign lessons and paths, or offer on-demand training to individuals, specific teams, or the entire company. Ready to see Lessonly in action? Customize the learning experience with your company logo, fonts, images, and brand colors. People who practice their skills get better results. Teams at work are no different. 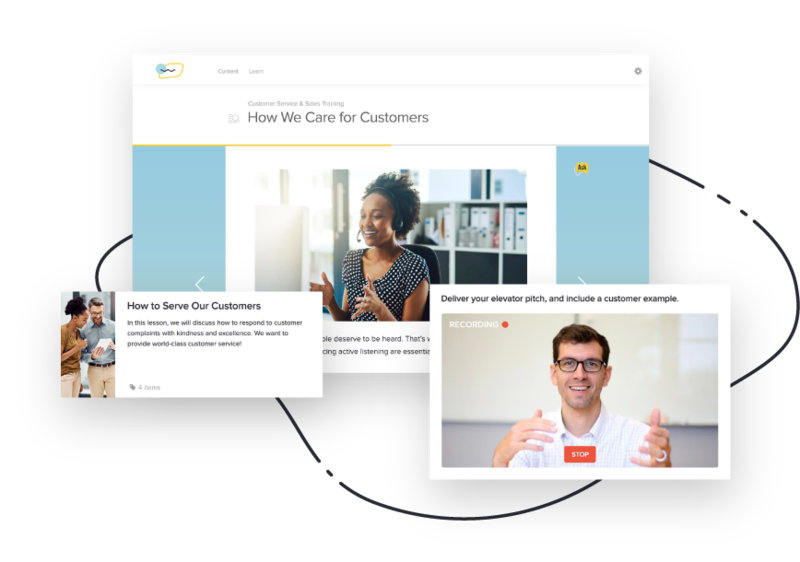 Rehearse pitches and customer interactions on video. Capture all or part of a screen, along with audio, to refine product or presentation walkthroughs. Improve chat skills in a realistic scenario—before being in front of customers. Practice thoughtful ticket handling—from prioritization to resolution. Draft or reply to mock emails from customers or prospects to practice email interactions. Evaluate practice scenarios with custom criteria so your team focuses on the right skills and gets more specific feedback. Measure and continuously improve team training with our complete reporting solution. Visualize training engagement and satisfaction so that your team can find areas of growth and make better decisions. See completion data and quiz performance across specific lessons, paths, or groups in one convenient place. Drill into data about specific lessons, users, or groups to identify knowledge gaps and opportunities for improvement. Integrate Lessonly with your tech stack to simplify learning. Recommend the critical information people need to do better work—when and where they need it—right in Chrome. 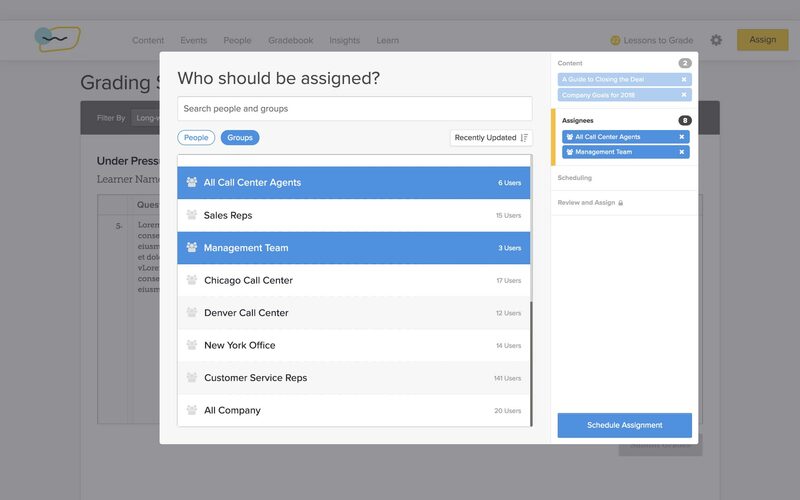 Pull support tickets from Zendesk into Lessonly to practice ticketing in a realistic training scenario. 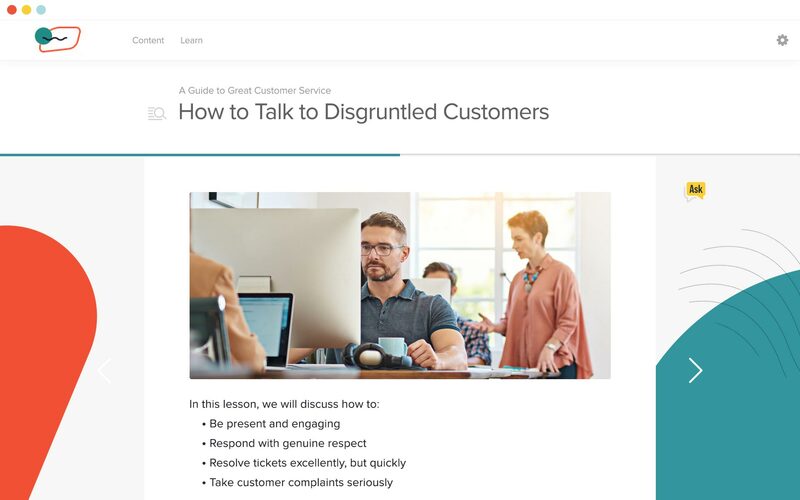 Connect Lessonly directly to Salesforce to streamline enablement and training—and measure the business impact. Our open API makes it easy to extend Lessonly’s potential for a powerful and customized experience. You’re not alone—we promise. Our team will walk with you to build a better training program and Do Better Work. A dedicated customer experience manager serves as guide, advisor, and friend, every step of the way. And if you’re looking for help on training strategies, program design, instructor-led training, or even someone to build lessons for your team—our Services Team is ready to go. Lessonly is built for simplicity, with tools to address complex training needs. Read more about a few of our favorite features, or see a demo of Lessonly. Build paths to guide individuals or teams through learning to customize each employee’s path to productivity. Manage admin and contributor roles through a variety of permission options. Organize learning content to ensure the right employees get the right information. Integrate Lessonly data with other tools to share and manage your users, groups, or analytics. 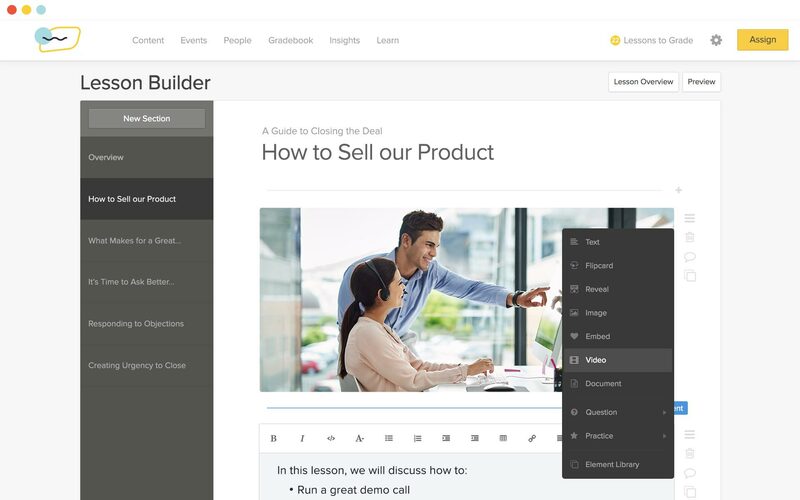 Access lesson templates, best practices, and other pre-made content in our learning hub. Easily add new employees to Lessonly, including key characteristics like department and function. Create and track attendance for training activities that don’t occur in Lessonly. Automatically send completion reports and other information to your preferred database. Export Lessons for offline use in other training venues. Add teammates automatically to custom groups, so they have access to the right learning at the right time. Integrate internal directories with Lessonly to eliminate password fatigue and the risk of phishing. Create as many lessons, courses, and learning paths as your team needs.